Python is one of the most popular languages out there as far as programming is concerned. With development of this language starting in 1980s, it was awarded as the most popular programming language in 2013. Python is an open-source, object-oriented, multi-threaded programming language that has reached widespread adoption since its birth. Simplicity, one of Python's core philosophies, has made the open-source programming tongue quite popular amongst beginners. As compared to other languages, Python relies heavily on simplicity. Less is more, is one of the key aspects of Python. 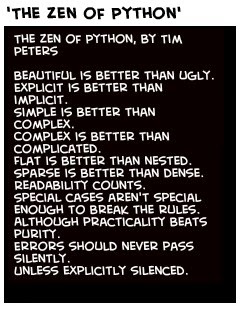 A great summation of the language's philosophy has been published by Tim Peters in a document titled "The Zen of Python." The following few lines from that document give you a taste of what Python is really about. If you are an entrepreneur looking to design an MVP or Minimum Viable Product, Real Python is the only course you need. Unlike any other course out there, Real Python teaches you only the things you need to start turning your ideas into reality. This means that instead of learning every bit and byte of the language itself, you'll be equipping yourself with only the necessary stuff you need to make a solid web application. Real Python comprises 3 courses: course 1 and course 2 teach you the basics of python and web development. Course 3 on the other hand teaches you advanced web development with Django 1.6. While the first two courses are available for download right away, the third one -- which was a part of a successful Kickstarter funding -- will be available in March. Don't let the title of the course fool you. Learn Python the Hard Way is one of the best resources to learn Python quickly. The $30 course teaches you everything you need to learn to become a proficient Python programmer. What separates this course from other books on Python is that it focuses more on practice rather than theory. Each chapter makes you type out every line of code instead of spending hours reading about the language. In fact, each chapter in LPHW is an exercise in itself, thus helping you "do" rather than just read. There is no way to tell how much time it would take for you to complete this course because it depends on how much work you really put in. If you are not able to shell out $30 just yet, don't worry. There is a free version of the course out there that covers almost all of the syllabus. Aimed at beginners, not only will you be learning programming in this course, you'll also be giving tests and doing homework like in a real classroom. Taught by David Evans who is a Professor of Computer Science at the University of Virginia, CS101 teaches you the key concepts of computer science so that you can skillfully apply them into building something cool. By the end of the course, you'll be equipped to write code in Python, and yes, build your own search engine. The syllabus comprises videos and exercises that help you learn better. One of the best parts about CS101 is that it takes approximately 6 weeks to learn, which is fairly quick considering what you'll be learning here. Also, by the end of the course you get a certificate of completion, which is another bonus point as far as your employment search goes.